The Asiatic or Iranian cheetah has a slender, long-legged body with blunt, semi-retractable claws. Its coat is tan with small round black spots and the fur is coarse and short. The cheetah has a small head with high-set eyes. 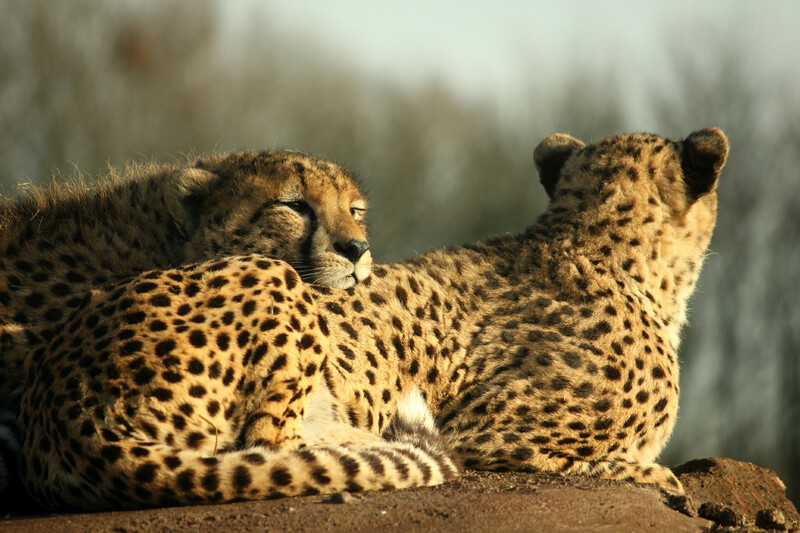 Black “tear marks” run from the corner of the eyes down the sides of the nose to the mouth which are thicker in the Iranian cheetahs in comparison with the Africans. What is the Size of a Iranian Cheetah? Adult body length 112-135 cm; tail length 66-84 cm; shoulder height 60-75cm; weight 34-54 kg. The male is slightly larger than the female. The cheetah’s flexible spine, oversized liver, enlarged heart, wide nostrils, increased lung capacity and thin, muscular body make this cat the swiftest land hunter in the world. Covering 7-8 meters in a stride, with only one foot touching the ground at a time, the cheetah can reach a speed of 110km/h in seconds, but the animal can not keep it for more than 300-400 m. At two points in the stride, no feet touch the ground. The African cheetahs thrive in open grasslands and savannahs unlike the Iranian cheetahs who live in vast expanses of semi-desert and desert terrains dominated by foothills and mountainous habitats where prey species such as wild sheep, wild goat and gazelle are abundant. Studies have shown that the main prey species for the Iranian cheetah is wild sheep Ovis orientalis, wild goat Capra aegagrus, Jebeer gazelle Gazella bennettii, and Persian goitered gazelle Gazella subgutturosa. However, the animal used to kill hares and occasionally lizards. It is believed among local people that the cheetah attacks their livestock and camels, but our surveys show that it is very rare to kill livestock. Cheetahs have a unique, well-structured social order. Studies in Iran has revealed that the females live alone except when they are raising cubs. The female raises cubs on her own. The first 18 months of a cub’s life are so important; cubs learn many lessons because survival depends on knowing how to hunt wild prey species and how to avoid other predators such as leopards, wolves and hyenas. At 18 months the mother leaves the cubs, who then form a sibling group. This group may stay together for another 6 months. At about 2 years, the female sibling leaves the group and the young males remain together for life. Males live alone or in coalition made up of brothers from the same litter. Some coalition maintain territories in order to find females with which to mate. Territories are often located in areas where there is a rich supply of wild game and/or water. Fierce fights between male coalitions, resulting in serious injury or death can occur when defending territories. Sexual maturity occurs at 20-23 months. The mating season is mainly in Dec and after 3 months gestation, the female gives birth to 3-4 cubs in March-April. The cubs are up to 30 cm long and weight approximately 300 grams at birth. They are smoky-gray in color with long hair, called mantle, running along their backs. The mantle has several purposes; for instance, it is thought to help camouflage the cub in the dead grass and bushes. It is also thought to work as a mimicry defense, making the cub resemble a honey badger (ratel). Studies have shown that the main prey species for the Iranian cheetah is wild sheep Ovis orientalis, wild goat Capra aegagrus, Jebeer gazelle Gazella bennettii and Persian goitered gazelle Gazella subgutturosa. However, the animal used to kill hares and occasionally lizards. It is believed among local people that the cheetah attacks their livestock and camels, but no proven record has been before done. Before World War II, the cheetah population was estimated to be around 400, ranging in almost all of the steppes and desert areas of the eastern half of the country and some western terrains near the Iraqi border (Harrington, 1971), but the advent of the jeep after the war marked the beginning of a decrease of this animal, largely through slaughter of their essential prey species, the gazelle (Lay, 1967). As a result, the cheetah population declined greatly in number. In 1956, the former Iranian Game Council declared the gazelle as protected by law and the cheetah too, in 1959. The gazelle population recovered in many areas and so did the cheetah. Cheetah sightings increased in different localities, particularly inside the gazelle habitats, revealing a remarkable resurgence of its population and the efficacy of conservational measures. In the late 1970s, the cheetah population was estimated to be 200-300 for the whole of the country (Firouz, 1976), while some other experts believing it as an over-estimation noted an approximate number of 100, including 30 cheetahs for Khosh Yeilagh area (Joslin, 1984), where cheetah sighting was so common (e.g. in two cases in 1970 and 1973, 13 and 9 animals were seen just during a couple of hours). The cheetah range appeared to include all the desert areas of the eastern half of the country which consists of vast expanses of largely unpopulated terrains. In 1979, the country witnessed a revolution, which interrupted wildlife conservation for a few years. So many areas were occupied by livestock and the flat plains and steppes became the field of manoeuvre for armed 4WD vehicles and motorbikes chasing desert species, such as Persian gazelle Gazella subgutturosa, Jebeer gazelle Gazella bennettii, onager Equus hemionus onager, and also the cheetah. Gazelles declined in many areas, so the cheetahs had to move toward the foothills and mountainous habitats to avoid human persecution. On the other hand, because of the remarkable reduction in gazelle numbers, the cheetahs had to look for a new food source, wild sheep Ovis orientalis and wild goat Capra aegagrus, which, in their mountain habitat, had not suffered the same pressures as the gazelles. Khosh Yeilagh PA, which was once considered the best cheetah habitat in Asia, was devastated and the last cheetahs were observed in 1983. The cheetah disappeared from many of its former ranges and was limited to some remote areas with a reliable prey population and relative safety.